When I left the non-profit world to join a Salesforce consultancy, I remember telling my wife, ‘well, now I just need to avoid falling flat on my face.’ It was scary leaving a field where I had built a pretty successful career to enter the tech world, especially since I was leaving an executive leadership position and starting at the bottom of this new career ladder. Honestly, I did not belong at a gold Salesforce consultancy like Summa at that time, my skills were not as sharp as they needed to be. I later found out there were a few Summanoids I met with who did not recommend me for hire – it was a fair assessment. I invested time in tangible skills that could help me be a better delivery consultant. I relied on the answer & collaboration community pages, blogs, and trailhead to pick up Salesforce knowledge. I shadowed and volunteered for nonprofits so I could practice at functional areas like public speaking, leading workshops, requirements gathering, solution design, estimating, etc. I started to find success at work thanks to a Senior Consultant (Doug Hammer) that gave me a chance on a few projects he was leading and really put a lot of faith in me. His ‘Hammertic Method’ of questioning every design decision and making me think through the user experience provided a framework for the skills I was developing. Despite this traction, I was petrified when Doug recommended me to lead a project on my own only 6 months into my consulting career. It was a small non-profit quick start, something he felt was right in my wheelhouse. I thought this was the moment I would be found out, but despite my self doubts, the project went well, in part because I worked some evening hours off books to deliver some extra features (sorry Hammer). A month later though, I knew I was exposed, I couldn’t hide behind late night work sessions. I wrote this blog, Now is the Time for Lightning Experience, and took a really strong position on Lightning Experience before it was widely adopted (Summa didn’t start doing Lightning as default for all new implementations for another 4-5 months). It caught on with the Collaboration community and soon I was invited by Toni Martin (follow her, she is a rockstar! 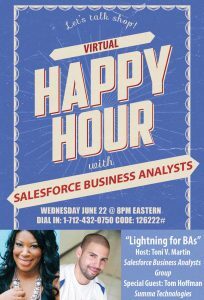 @tonivallentine) to speak about Lightning during her Virtual Happy Hour with the Salefsorce Business Analyst group. Holy crap. I have to talk for an hour. Oh crap, oh crap, oh crap, oh crap, oh crap. I played it cool when the team as Summa said things like, ‘Oh this is great’, ‘that is a great response to your blog’, etc. Meanwhile, I was freaking out…I think I spent about 10 hours reading through all the lightning information I could so I would not be caught off guard. In the end the hour breezed by, I feel I handled myself well (i’ve never gone back and listened…too scared), and so I survived that as well. This scenario played out pretty consistently, I would put myself out there to do something new, like lead Salesforce projects for PGH Givecamp, do presentations at Summa events, lead a demo jam, and each time I would be petrified that someone would see through my loud, outgoing confidence and ask me a question that would show I don’t belong here. I would put off working on projects until the last minute, worked too much and sometimes for free (sorry again Doug) to make sure clients were happy, over prepare for some things, or would float grand ideas and never follow through for fear of failure. It turns out these are all pretty standard symptoms of imposter syndrome. After a while though, they started to fade into the background, I became more confident in my skills, my self-talk started to match my public persona, I was beating this thing…and then I decided to make a career move. With the recruiters I positioned myself as an emerging Senior Consultant, ready to help lead projects, develop teams, and grow a business – but even as I had senior & solution architect interviews (and several offers) I was petrified. In the weeks around the transition to Spark.Orange, I had some free time and I began exploring the Trailblazer community more. I saw a few questions I knew the answer to and replied, a few people thank you’s and best answers later, I was hooked. I started answering questions in the evenings and during down times in my day. I would research even the simplest of answers, I wanted to make sure every answer was perfect, lest someone in the community correct an answer I provided. Within the first week though, both Steve Molis (@SteveMoForce) & Jeff May (@JeffMTI), had corrected something I wrote. Oh God…I was mortified, pretty sure I even deleted one answer and left Jeff’s correction floating without context. Steve Molis, the man with all the answers, MVP Hall of Famer, someone that literally all of the Salesforce community owes a beer, decided I was worth a follow. I know this seems silly right, a grown person ‘star-struck’ because another person in the same industry follows them in a professional community, but as I battle the fear of being found wanting, it is another small win I can use to challenge these feelings (see #4 above). She was being light-hearted, but I can tell you on that day, I felt legitimate & believed I could live up to the expectations. ← Salesforce Was Dropped in My Lap – Now What?